Coffees of the finest origin, roasted daily at The Drowsy Poet, a unique coffee company dedicated to providing the highest quality coffee experience that can be found anywhere in the world. BRAZILIAN is a medium body, smooth, soft, nutty flavor with bittersweet chocolate tones. Our Brazilian specialty bean is noted for its low acidity. Enjoy a fresh 12 oz bag of coffee delivered to your doorstep. COLOMBIAN: Grown in the high Andes to exacting standards, this coffee is from the southern region of Narino, an area famous for producing the finest Colombian coffees. Prized for its sweet aromatic taste, our Colombian balances a mellow-body coffee, with vibrant acidity, and a rich, bright flavor. COSTA RICAN: Grown in the Tres Rios district at an altitude of 3,900 to 5,400 feet, Costa Rica La Lapa beans are the highest grade “SHB” or Strictly Hard Bean. They yield a complete coffee possessing all the characteristics specialty coffees should contain: high acidity, medium to heavy body and good aroma—all in perfect balance. 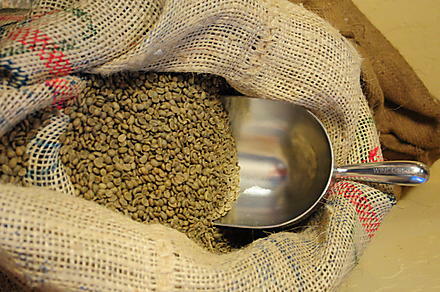 Our Costa Rican portrays the fine Central American coffee qualities of lively, snappy, and clean. DECAF SWISS WATER-WASHED: Taking the extra time and expense for the Swiss Water-Washed method of decaffeinating is just one more way The Drowsy Poet ensures the highest possible quality coffee for our customers! Our method of choice removes 97% of the caffeine, but only the least amount of the smooth, nutty flavor from this cup for the end of your day. ESPRESSO: Our Espresso combines the finest blend of coffees from around the world and roasts them to perfection for a sharp, sweet cup with exquisite créma. This Drowsy Poet masterpiece keeps our customers coming back for cappuccinos, lattes and macchiatos! ETHIOPIAN BLEND: Ethiopia is the birthplace of Arabica coffee producing some of the finest and the most unique coffees in the world. Grown at an altitude of over 7,000 feet, these two Arabicas yield very small beans with a highly concentrated flavor. Skillfully blending YIRGACHEFFE with its complex floral and citrusy tones, with HARRAR and its mixed fruit and dark chocolate complex flavors gives us our amazing Ethiopian Blend! Honduran coffee growers have been striving hard in the new millennium to bring their product up to specialty coffee standards. Having reached our standard of excellence, we now offer our Honduran bold, dark roast, a smooth brew with a hint of chocolaty overtones. Its lower acidity gives this cup a bright flavor with a satisfying finish that begs for another sip! HOUSE BLEND: Crafted to exacting standards, this bold blend combines coffees from three continents! Our master roasters have created an incredible full-bodied, perfectly balanced brew that delights the senses.